To the outside world, she’s an emotionless, broken marionette. Inside, her father’s fiery end haunts her every waking moment. She never cared for destiny or politics, until the angel Raziel focused her anger. Both friend and foe alike believe her grip on sanity tenuous; she knows he is real, and pities those who will never feel his divine presence. Whenever her adrenaline wears off, guilt at what her bombs did cuts deep, as does the apathy of the citizens she wants to liberate. The pain worsens after unexpected love cracks open her armored heart, causing her to question the role she plays in the bloody conflict. 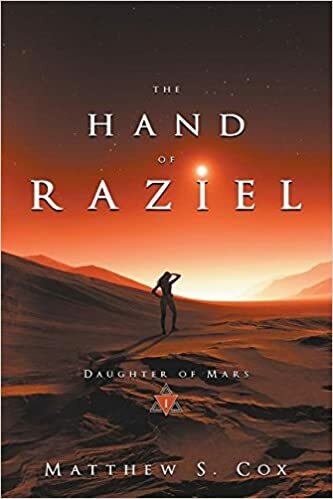 The Hand of Raziel (book one in a series by Matthew S Cox) is set on Mars in the future. Two large Earth governments are controlling Mars. In addition there is a movement to try and liberate Mars from the control of these outsiders. The movement is the Mars Liberation Front or the MLF. Risa (Black) is the central figure in this story and she is working for the MLF. While basically human she has had a lot of cybernetics/devices incorporated into her “being”. This gives her a large number of extra powers/abilities which give her the edge on those who would like to end her missions. She has an additional advantage – an angel, Raziel – talks to her and helps her. I actually find this book quite hard to review in some ways. There is plenty going for it in a positive sense. Risa is a good enough character. The story is action packed and entertaining with quite a degree of humour at times. The writing is vivid enough to make you feel as though you are there in many of the scenes. It is frequently tense and fast paced. While working for Martian liberation Risa is on her own quest into her past at the same time and this adds a very good dimension to the story for me. I enjoyed the idea of Raziel as an angle who “speaks” to Risa (inside her head) – I’m guessing that may be developed in future books.